**Today the Renegade Rowing Club will be performing the Fitness Block from the Renegade Rowing Training Plan Template for this week. Below is the plan that was posted earlier this week. Check it out and let us know if you have any questions! 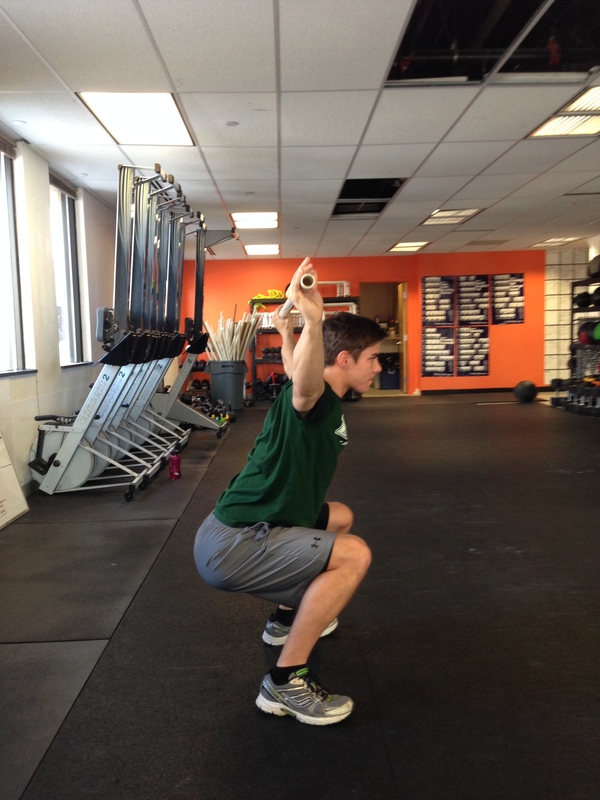 Jimmy from the Loyola Men’s Crew Team working his Shoulder Flexibility in the Overhead Squat last Winter. Post Time and Average Split to Comments. Today’s Rowing WOD is a great opportunity for any athlete, experienced or not, to get a sense of form and rhythm and then apply it in competition. Get in a solid warm up and hone your rowing skills with a 10min WarmUp on the Erg and then attack the Conditioning WOD with your new found efficiency and focus on form. Rhythm and Endurance are two necessities for successful competition in longer WODs. A great example would be the KB Swings and Pull Ups found in “Helen” or the necessity to be fresh enough for the thrusters and pull ups in Jackie. Those who find a consistent rhythm can flow through the movements naturally and rely on their aerobic endurance without dipping into their anaerobic energy supply. When going from a 20 stroke rating to a 24 you should focus on more pressure with the legs and quickly redirecting the hands through the finish. This will help increase the stroke rating while leaving you the same amount of time to sit up, breathe, and relax as you slide forward on the recovery. When you attack “Nancy in a Boat” pick a challenging split and stroke rating to hold, but make sure you’re able to remain efficient and fresh enough to perform the overhead squats unbroken. If you know your 2k split, pick a goal split somewhere between 2k and 2k+3. Try to focus on your rhythm and ratio to allow for breathing and recovery every single stroke. Get after it and have a solid day of training! We will re-test “Nancy in a Boat” next week! Sorry I didn’t get you those pace recommendations Ward. Came up with them tonight. Wall Balls could be a good sub or perhaps a moderately heavy goblet squat. Rest up and have fun attacking it! Talk soon! 1:48; 1:58; 1:55; 1:55 and 1:54 on the splits; 18:15 on the WOD overall (w/ 68# OHS). Good thing the C.R.A.S.H. Bs are almost four months away…. Haha! Awesome work Thor! We’ll keep dialing in that game plan! almost all negative splits dang it!!! Awesome Drew! Sick Overhead squats! Substituted air squats for OHS. GOAL was 1:58 fir first, then minus one fir each subsequent set. Still good execution. Way to bring it back down In the last three! Great sub Tom! Ya that one gets crazy right around round 3.